One of the things that one learns while single handing is that furling the jib in strong winds is quite a task. This is true even if you have already reefed down. Like many things on production sailboats the furler drum is about the minimum size that the designer could get away with. It really needs to be about twice the size. When the sail was at the appropriate size the line was then lead back to the deck cleat and tied off. The reason is obvious from the picture (once you know what to look for.) Note the angle of the jam cleat. This cleat is supposed to be flat, the forces on the cleat have bent it upwards. The back power clutch is for the gybe preventer. The block in front turns the jib furling line around. The forward power clutch holds the furling line in place. The lines are missing as I am waiting for the 3M 4000 to dry. I am planning on getting underway in a few days so there will be ample opportunity for a sea trial. "In aerospace engineering, the maximum dynamic pressure, often referred to as maximum Q or max Q, is the point at which aerodynamic stress on a vehicle in atmospheric flight is maximized." In other words, if it doesn't fall apart at Max Q you have a chance of survival. On Reboot Max Q is reached when every locker, compartment, and storage area has been emptied during some project so that there is no longer any possible place to walk around inside the boat. It is also a turning point. Usually this is the point at which projects are starting to be completed and things are being put back away. Today I felt like I reached Max Q. Drove to store and bought beer. Item "5" complete intend to watch the sunset. 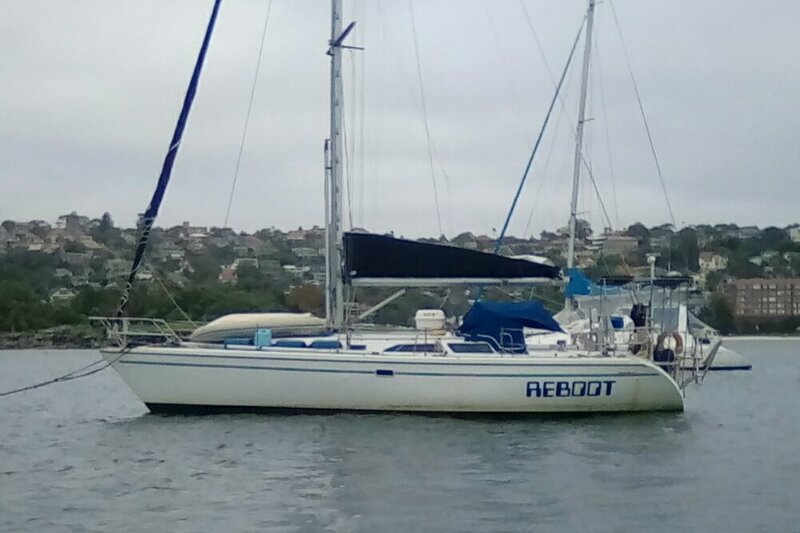 Reboot is back in the water. I spent most of today debugging electronics problems. They all seem to be corroded cable connections. More tomorrow. 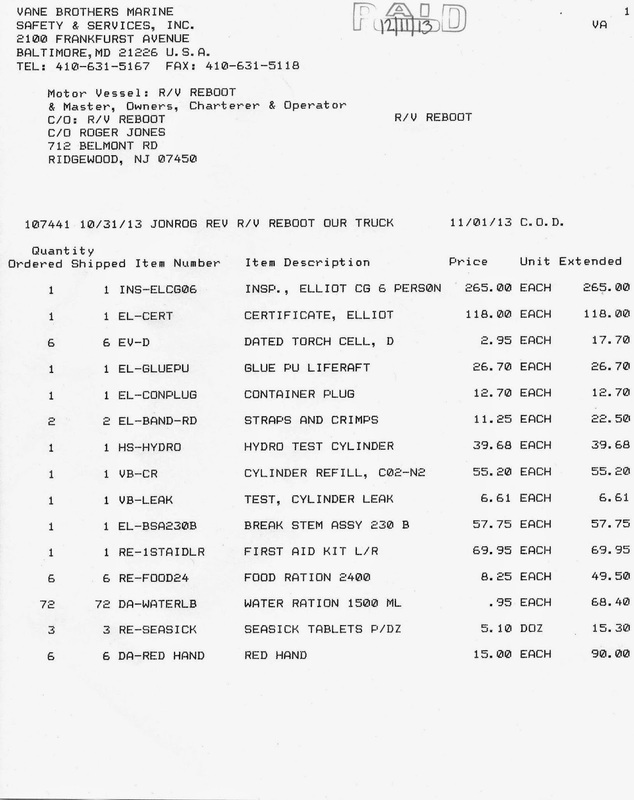 For those who have been asking here is my receipts from Vane Brothers to bring the Life Raft into compliance. It will also give you a good idea what is inside the box! 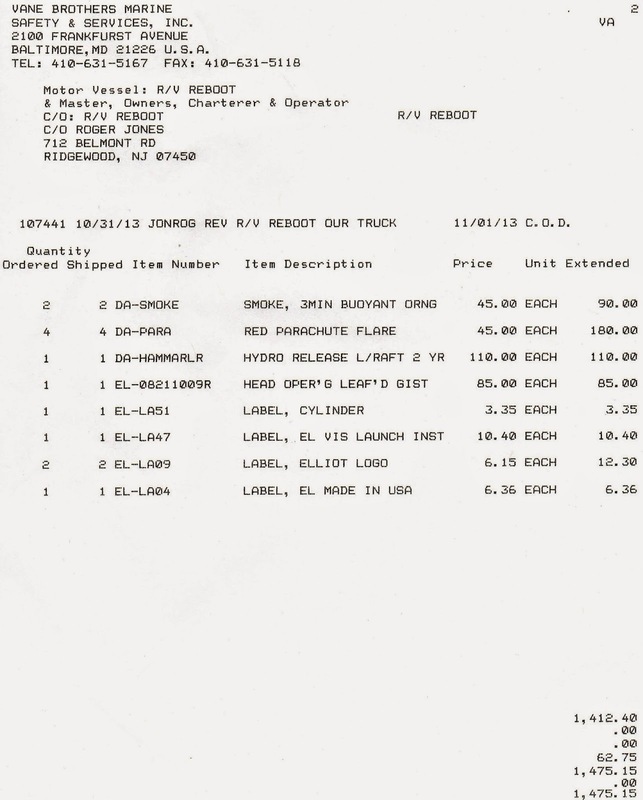 Total bill was $1,475. I used Vane Brothers in Norfolk. They were professional and great. They even let me pull the lanyard! Back in the early days of mainframe computing we used to run the big batch job of the night called "merge - purge. "This was in the day when there were few or no random access devices (read disk drives) and everything was done on tape. Essentially we would run the day's transactions through the edit software. Then it would be "merged" with the database. Then all the deleted records would be "purged" It was possible to mark a record as deleted on a tape but the normal process was to copy the tape to another tape dropping all the deleted records. This batch job was the "big deal" for two reasons: it was the "eye of the needle" that every other job needed to pass through; and it usually ran for several hours. If it crashed the result was no computer reports the next morning. I was reminded of this because I spent the better part of today on a merge purge. I have a number of storage boxes on Reboot and over time they have gotten filled with a random assortment of things. As a result whenever I need something I have to go through all of the boxes. So today I did the big sort (usually done twice or three times in every merge purge batch job) and merged all the tools into one box, the parts into another box, etc. In the process I purged about 300 lbs of stuff: sold some, put some on the free table, and put some in the trash (like my HP calculator I used in school back in the day.) My back is a bit sore but I got a lot done. I am feeling accomplished. Web sites ask what role - watch stander, competent crew, inexperienced passenger you intend to fill. I am amazed at the disconnect between desired roles and the people posting. When I see a woman in her 40's posting as a steward/stewardess I don't know what to think. First, stewardesses on megayachts are inevitably "hot" and between 18 and 25 years old. 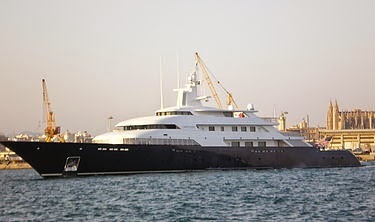 The Captain's of megayachts are not looking on Find-a-Crew for crew either. The Captain/Owner of a sailboat isn't looking for a cook, diver, steward/stewardess, photographer etc. The only roles are: watch stander, crew, and nanny/childcare. We are talking about boats with maybe 4 people on board. There is not a lot of room for specialization. Most cruisers can do all the things that you think will be reasons to bring you on board. We know how to fix things. Most of us dive - it is a lot cheaper than paying someone each month to scrub the bottom. We know how to take pictures - we spend our life surrounded by beauty. On most ships with a female significant other they can do a pretty good job cooking too. (We solo guys don't do a lot of cooking - at least I don't.) What we need are people who can stay awake, understand if the weather is changing, and apply brute force when necessary to handle the sails. We also need people who don't freak out when the weather turns to poo. Most of us bring crew on board for companionship and to make it possible to get a little bit of sleep. Right now (March) there are a lot of people looking to crew to the Caribbean. No boats are going to the Caribbean, its almost hurricane season! All the boats are going the other way. The second disconnect is people who have a couple of weeks and want to sail thousands of miles. Sailboats don't go that fast! There is a quid pro quo to crewing on a sailboat. Expect to pay for your own food and entertainment. Most boats will set $10 to $15 per day for food. There are lots of people who want to crew. Don't expect me to take you aboard and pay your bills. Also, if someone is asking for a lot of money they are trying to make money on you. Find someone else. Quite a few young people want to crew. I think they are put off by the fact that most boats are captained by someone in their late 50's to 70's. The fact is that it costs a lot of money to purchase and outfit a boat. Most cruisers are retired - they are fulfilling a lifelong dream to go sailing. Most Captains in their 30's and 40's are weekend sailors with family. They are not normally looking for crew. Good Captains are first and foremost concerned about the safety of the crew and boat - in that order. Ocean sailing is an experience like no other. No Captain concerned about safety is going to take someone who has never sailed several hundred or thousand miles offshore on a long offshore passage. At a minimum one should have significant experience sailing in coastal conditions. It is actually easy to get experience - every local yacht or boat club has learn to sail opportunities. Most also run sailboat races. Usually there are several racers looking for crew. Most of us have had bad experiences with teams. It is human nature for a team to take the other team member's side in a dispute. This is not something any Captain wants to deal with. These are pictures of my new keel cooler installation. This is a device that circulates the refrigerant for the ice box and refrigerator into a heat transfer device that cools the refrigerant by using the water the boat is sitting in. In the past there have been two ways to cool the refrigerant: using an air cooled coil or pumping water through a heat exchanger. (This is, by the way, how marine engines are cooled. This keeps the salt water out of the engine cooling system. In recent years Frigoboat has pioneered the use of a "keel cooler" as the heat exchanger. One of the annoying things about installing things on boats is that you always have to move and disconnect all sorts of things to get to the place you want to do the installation. This was no different. I had to remove most of the battery system to get to the hull. In the process I discovered that there was water leaking into the area. So as is also typical one simple project has lead to another. Oh well. 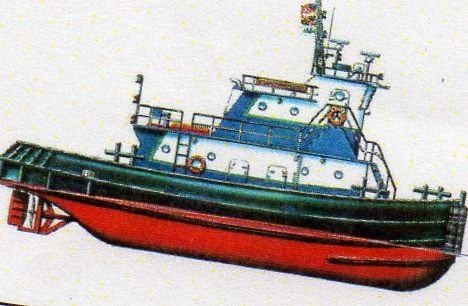 On boats, and sailboats in particular, the bottom is coated with either an ablative (slowly shucks off with the marine grown attachment) or a hard (discourages marine growth attachment) paint. At the moment Reboot's bottom is painted with Trinidad PRO. This is a high copper load hard bottom paint. (They used to put tin in the paint, it worked much better but it has been banned in the US. It is the anti-fouling chemical of choice in every other country in the world because it works! The problem with this is that the propeller shaft and propeller get gooked up with growth. I decided to try an anit-fouling paint specifically designed for propeller shafts. It is a three coat processes. Above you see the first coat going on the shaft. I will see how it works out. I use these quick release shackles in a lot of places on Reboot. The problem is that the string that releases the shackle rots out. Of course you would expect that things made for a sailboat would take into account sun and salt. It never ceases to amaze me how many products don't. After several months of frustration trying to find a replacement cord (the broken one is visible in the upper right corner of the shackle, it looks dirty brown. It is at the swivel) and not finding them in several marine stores I realized that I was trying to replace a hunk of cord (duh.) I went into my sail repair kit, got out some waxed heavy thread and fashioned replacement pull cords. Total cost - zip. Total time - 30 minutes. BTW the replacement cords (the wrong ones) available in the stores cost about $6.00 for three. You made it through the sea trial. The bank loves you. You are still with your significant other (or not.) You are about to (or have) taken delivery. You are ready to move on. What do you take? 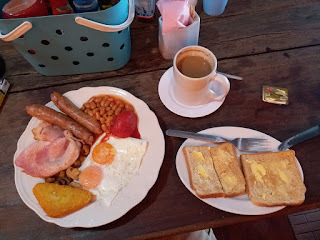 Viewpoint: My blog is written from the standpoint of a world cruiser. If you are going to buy a boat, keep it at a local marina near your home, and store your cleaning stuff in your dock box this post really isn't relevant. Post Cruise Cleaning: After a cruise of any duration a deep cleaning is required. One normally also has to open every cabinet and drawer and air it out. Most clothing will have absorbed moisture and need to be dried. Having completed the major exterior projects on Reboot it was time to focus some attention to bringing the interior back in shape.As a result I have been sorting and tossing as I go through each part of the boat. The "Free Table:" In the days before E-Bay cruisers created the "free table." In every marina there was a spot where cruisers could leave things they no longer needed to be collected by other cruisers that could put them to use. Some items were taken to marine consignment stores and now some are sold on E-Bay and Craig's list. But the tradition still holds of putting out your spare gear for other cruiser's benefit. One of the most critical resources on a boat is water. Water is for drinking and occasional sponge baths, not for washing dishes. Paper is quiet. Sailboats are not quiet. The sound of the wind, the banging of the waves against the hull, these are things one learns to appreciate (except when the wind exceeds 30 knots or the waves 5 feet.) Everything else is a distraction. In a storm the clinking of the china and glassware is enough to drive one crazy if one is not already in this state. Paper (not plastic coated) can be disposed of overboard when at sea. This greatly reduces the amount of garbage one is carrying around. Pots and Pans: What do you cook? How many pots and pans do you really need? After consideration about 80% of my stock headed for the free table. Kitchenware: (or gadgets.) Do you really need a lettuce dryer? A garlic press? 45 different kinds of spices (that will all get moist and ruined?) By the same token you need two of the critical things that might rust or break (like a can opener and a wand lighter.) Some things are small and easy to store (like a cheese grater.) Some are important (like measuring cups (get plastic.)) Cast a critical eye. Dump the excess. Boating clothing: If you visit West Marine you will find a large quantity of "soft goods." They are following the lead of Harley Davidson who found they could make more money selling clothing than motorcycles in their stores. Most of it is overpriced junk. (I once visited the Madison Avenue Calvin Kline store with a very attractive young lady - they though I was her sugar daddy but I am actually just a friend. They showed her some "boating wear" that started at $3,500 for a pair of shorts and $4,500 for the matching top! What a joke! The stuff was so over designed that one would be laughed off the dock!) Any decent quality clothing is going to be fine. Plus you want a bunch of cheap junk - trashing a $!5 T-shirt from Walmart is a lot easier than a $90 shirt from the department store. "Fish rods" for running cables for new equipment behind the surface areas of the boat. Engine oil changing device (most marine engines don't have a drain plug. You change the oil by sucking it out of the dip stick tube with a vacuum device. Over time you will figure out what you use all the time (things like screwdrivers, wrenches, etc.) and they will get stored in an easy to use place. The rest you will either pack carefully (to protect them from corrosion) or take off the boat. Fuel filters: At least two of each type on the boat. If you clog a filter chances are the replacement will clog quickly hence the need for at least two. I always keep five (5) spares on the boat. I have had friends who have gone through all five in one incident. Impellers: At least two (the impeller is the thing that keeps the water circulating in the engine. Broken impeller, no engine. Fuel treatment (biocide) Diesel fuel, particularly in hot climates gets full of growth that clogs the fuel filters. Batteries, lots of them - AAA, AA, D, etc. My only note here is pay attention to the "active ingredients." Usually they are cheaper to purchase (like oxalic acid) then the formulated products. White vinegar is cheap and as good a head treatment as the expensive stuff you buy at the boat store. Following is from Sally aboard Seaquel, anchored this morning off Boqueron PR. It explains the emergency and the head injury, as well as the trip to PR afterwards. The short version is that we are fine,the boat is good and we are sitting in Boqueron PR at anchor waiting for the mechanic! On Wednesday at 0600 we left the anchorage at San Juan for the Turks and Caicos. The distance is 360 miles. For us averaging 5.5 knots it would be a 60 hour trip...a two nighter! We were making great time averaging over 6 knots when I noticed that the bilge pump was on. It was 3 AM (naturally) and we were 120 miles from the Dominican Republic and from Puerto Rico! We tried to find the source of water and deal with pumping it out with a shop vac since the bilge pump was not keeping up. Andy decided that the best thing to do was call the coast guard, but our VHF would never get through so he interrupted a ham net and asked for someone to call the U.S. Coast Guard in PR. Bless those hams! He called the coast guard and we went back to our problem. We found that the Dripless stuffing box that goes between the shaft and the transmission had worked loose and by jamming a screw driver in place immobilizing the shaft from turning kept the water from coming in. About this time the Coast Guard arrived in a helicopter and called us on VHF. They wanted to know how we were doing and how they could help. They had a pump with them which they offered but we decided we did not need it. We had stopped the leak and gotten rid of the water. We told them that we would be returning to P R under sail because we could not use the engine without the shaft turning! As the CG is getting ready to leave Andy takes a bad fall,cutting his head about 4 inches above the ear. Suddenly there is another problem! The cut is bleeding profusely and Andy is dazed and feeling sick. I called the CG who are still hovering and tell them what has just happened. We decide their on board medic should take a look at him. You can imagine the thoughts that are now going through my head! Andy is able to help me take the sails down so the boat is DIW. Dead in the water! The medic is lowered into the water and comes aboard to help Andy. After cleaning his wound he does not feel that Andy needs to be med evaced. YEW! In the mean time the helo has had to return to P R to refuel. After stabilizing Andy the Medic and I raise the sails and plot a position for the west coast of PR and off we go. When the helicopter returns they bring a sat phone for me to have to make future contacts and they have me try a call back to the station! What a wonderful psychological boast that was for us! The medic jumps in the water and we are on our own feeling that we have been fortunate to have averted two potentially dangerous situations. Are we ever lucky to have such professional people in our Coast Guard! As the CG left the sun is coming up and we sail until 11:30 pm when we are taken under tow just outside of Boqueron PR. The sat phone was so helpful in arranging for SeaTow as well. They got us settled on the anchor. They also were very professional! Today hopefully we will have the mechanic fix our problem and we can plan to start again! During all this our Grandaughter Katie who is a LTJG (P) in the Coast Guard and a class mate of the helo pilot kept the family calm! We are so proud that she is a part of the CG. So that's the long story...we are tired, but blessed that we have so many that were thinking about us yesterday! Thank you all for your concerns and to all a good day! You found the boat of your dreams. You are doing your homework. What does that future look like? OK, its not the boat of your dreams. Its the boat that you can afford. Me too! (See picture left) Lets talk about next steps - after all you made it to part "3." I would not ever buy a boat without a professional survey. (OK, I would buy a Sunfish.) You will probably need a survey for insurance purposes. The first thing to understand is that a survey is like a life insurance physical. If you can fog a mirror you can get life insurance. If the boat floats it will pass a survey. Before hiring a surveyor have a long talk about what is covered and more importantly what is not covered. Many surveyors do not comment on the state of the auxiliary propulsion (engine, transmission, cutlass bearing, prop, etc.) Many do not survey the rig or the sails. You may have to hire four people, the surveyor, an engine mechanic, a sail maker and an expert rigger to really understand what you are about to purchase. Its worth the money. I once commented to a friend who works for a major sailboat designer that I saw many pretty boats at the boat shows but they did not seem very well laid out for cruising. My favorite is the pedestal bed in the forecastle. Anyone who has tried to sleep in the forecastle of a boat underway in even moderate seas knows that it is the most uncomfortable place on the boat. My friend said: "These boats are not designed for sailing. They are designed so that the wife will let the husband buy the boat at the boat show." True story. Duration: less than 1 hour. That is the perfect day if you want to sell the boat - and the broker who will take you on the sea trial does. Duration: As long as it takes to test everything. In the cruising world, particularly the open ocean cruising world you will rarely see the first set of conditions. You will frequently see the second set of conditions. You don't want to purchase based on scenario 1 when in truth you are going to be sailing in scenario 2. You cast off from the dock and get underway. Don't raise the sails! Your first step is to stop enjoying the scenery and visualizing yourself as owners. Go down inside the boat. Can you walk around? Are there sufficient handholds? Can you use the head, the stove, sleep in the bunk? Think about sleeping in the bunk in these waves. Can you do it? Because you will have to be able to. By now you have probably realized that fixing just about anything underway is going to be a chore. Don't blame it on this boat. Its a chore on any boat. Back topside. Check the engine controls. Is the engine running at an appropriate temperature. Is there oil pressure? Is the alternator charging the batteries? Are all the instruments working? Drop down to idle. Run up to full power. Drop back to economy cruise. This is the engine setting that gives you good headway without burning up lots of fuel. On most boats it will be around 2200 rpm but you will have to play a little bit. Time for the underway under power evolution. Box the compass and motor on each point as you name them. Look at the GPS speed over ground. How much headway do you lose fighting the wind and the waves? How much do you roll in a beam sea? Are these acceptable parameters? This is the reason you chose to go out in heavier weather and higher seas. In flat seas and light winds the boat is going to handle pretty much the same on every course. As the seas and wind get worse the performance on each compass point will alter quite a bit. OK, the moment you have been waiting for! Raise the sails. Don't let the broker raise the sails. You need to understand how hard it is to raise them. For most boats in the wind I have suggested you are going to need a reef. That is great, you will see how hard it is to put in a reef. There are two courses that require you to return to the interior and revisit all the questions above. The first is close hauled. The second is with the waves (not the wind) on the beam. These are the two most uncomfortable points of sail to be inside a boat. Back to the helm. Can you balance the rig? This means getting the sails set so that you don't have to steer. This takes almost all of the load off the rudder (and the electric autopilot.) In open seas you will not be able to maintain a perfect course without some input from the helm. The waves are going to bang the bow around. But you should be able to steer with one finger. With the sails balanced head upwind. How high can you point? In a 15 knot wind you are going to be able to point about as high as you will ever be able to point (at low wind speeds pointing high is very difficult.) One major drawback of catamarans (and I love them at the dock) is their inability to go up wind well. Are you happy with the pointing ability? Head downwind. Everything should calm down. You may want to do this step underway or wait until you get back to the dock. It is, simply, turn on every piece of electronics on the boat and see if it works. And I do mean everything. Look at all of the lines: sheets, halyards, dock lines. Are they frayed? Are they stiff? A new halyard on a bigger boat can cost $200 to $300. Dock lines are #40 each. How old is the upholstery? Does it show signs of wear? Replacing it, even if you do most of the work is a several thousand dollar evolution. Look at the dodger and the bimini. Is the cloth old? Are the windows brittle? Again, big bucks if they fail. Look in the bilge. Is the water clear? Is there oil in the bilge? Check the engine oil. Is it reasonably clean? Does it look as if it has been changed in the last century? Look at the tail shaft. Is it leaking more than a drip every once in a while? Finally, open every single compartment on the boat. Are they wet? Do they smell? Is there any sign of critter (bugs or mammal) infestation? Getting rid of bugs on a boat with EPA approved chemicals is an exercise in frustration. If they are wet after your sail they will always be wet. Not a useful place to store things. If possible take a pressure washer and spray all the windows and where the mast penetrates the deck. Do things leak? Nothing that you find is necessary a game breaker (other than water in the engine oil or oil in the bilge - both are very big buck problems.) You are not doing this to lower the price (although the buyer will believe you are.) You are doing it so that you know exactly how much work and money is being delivered with your new boat. I was chatting with a couple of guys here at Sailcraft Service and noted that in some way they are in the minor resurrection business. As the boats come out of the water on the marine travel lift they don't look like much. They get the bottom pressure washed but they still look rough. Then the magic happens. A new coat or coats of bottom paint. A wash, compound and wax of the sides. Liberal application of deck cleaner. Replacement of fraying sheets and halyards. Patching or replacing the worn out canvas dodgers, bimini, upholstery and sails. Cleaning (or sanding) and re-varnishing or oiling the wood. Voila! Once again a beautiful sailing machine. As I waxed poetic about the beauty of the transformation I was rudely interrupted by one of the staff. He said: "Yes Captain, when they leave they are beautiful, then you beat the sh&* out of them and bring them back!" You are out in the ocean. You are getting the stuff kicked out of you. The boat is launching off the waves only to crash down into the surf. You think about the forces involved. You wonder how your boat is constructed. Is that what's troubling you brother? If you have followed the recent adventures of Reboot you are aware we spent some time out in some rough seas, Today I re-bedded the two fixed windows in the main salon, That provided an opportunity to see just how thick the hull is. You are looking at it. It's quite a bit of thickness and layers. Here is a close up of the layup. The inner core (the top of the picture) is the "pretty" interior wood. Then comes a big slug of fiberglass, what appears to be another layer of wood (not sure about that) and then the gelcoat finish on the outside. Pretty impressive. Total thickness is about 1 inch. Problem number 1: My cockpit speakers are blown out from over partying by various guests on board. Problem number 2: When working on the boat I am frequently out of range of the cockpit speakers. Either I turn them way up (when they were not blown out) and annoy my neighbors or I don't have music on the bow or under the boat when working on it. Solution 1: Purchase a Mini Jambox Bluetooth speaker. This permits me to play music from my laptops - either saved music (from, for example iTunes) or web music from Spotify or Pandora. Setting aside for the moment that sometimes getting the right set of speakers attached to the right music source I can play music from my PC onto the JamBox and carry it around Reboot. Related problem: All of this is well and good. However, there is one limitation. I can not play audio from Reboot's built in audio system on my Bluetooth speakers. Reboot's audio system is actually a hybrid. It is an XM music player and also the source of XM marine weather for the multifunction display. When I am under the XM satellite it would be nice to be able to stream the XM audio to the Bluetooth speaker system. The obvious solution was to Bluetooth enable Reboot's audio system. Solution to related problem: A Bluetooth transmitter. Although Bluetooth audio can be bidirectional (for example when the Mini JamBox is hooked up to Skype I can talk to the other party through the speakers) what was required here was the ability to transmit audio from the sound system to the speakers. 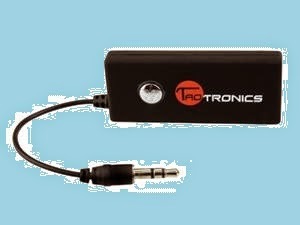 I did some research and selected a TaoTronics TT-BA01 Wireless Portable Bluetooth Stereo Music Transmitter. I purchased it on Amazon - total cost about $36. Once you have paired this unit with your speakers you plug in the audio jack to any audio output and voila! A nice addition to the boat. My good friend Ed (Hooligan), who solo circumnavigated on a 29 foot sailboat told me there are three things everyone needs on a boat: golf clubs, an umbrella, and a wheelbarrow. See the bottom of the post for the rest of the story. The world has changed. 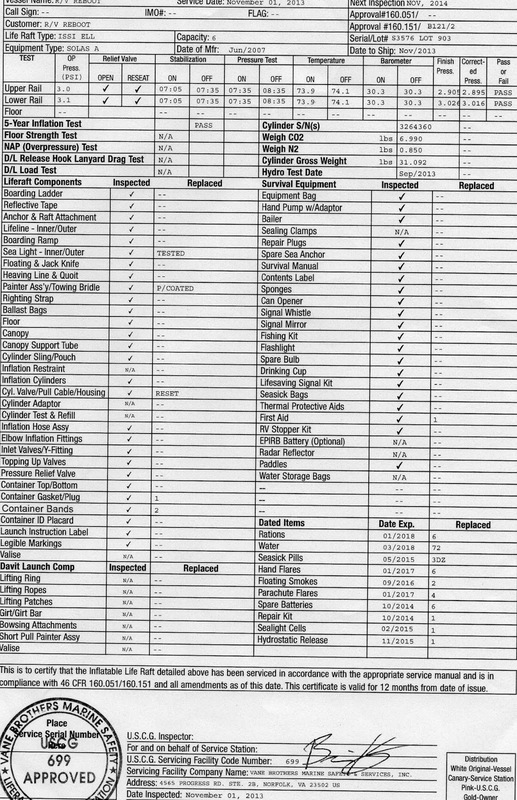 Equipping a sailboat today has quite a range of options that were not available 10 years ago. This posts talks about my equipment experiences over the last 6 years of living aboard and open ocean cruising. My purpose is to give you a prioritized list of how I, like all cruisers with limited means, would equip a sailboat. My purpose here is to focus primarily on "big ticket" items. One needs a first aid kit, fenders, dock lines, winch handles, etc. That is not the focus of this post. I do, however, start with Federally mandated requirements. The other Federally mandated safety equipment is usually integral to any boat you would purchase. A nice chart is here: http://www.boatsafe.com/nauticalknowhow/reqequip.htm. Now we get to the more interesting stuff. Remember, this is my personal opinion (and I explicitly refuse to accept any liability.) Your mileage may vary. Flyswatter, Mosquito Coils, Benadryl: You will thank me! Depth Gauge: Trying to steer by charts alone in narrow channels (like the ICW) is pretty hard. A depth gauge reminds you to hold on just before you run aground. Many boats come equipped with a depth gauge, and a speed gauge. A laptop (see "3" below) makes all of the sensors except for depth and wind redundant. Windex: It's a sailboat. Its nice to know the wind direction at the top of the mast. For $30 how can you pass this up? Wind speed indicators are nice but the helm does a good job. You can't steer? Too much wind for the sails. You aren't going. Too little wind for the sails. You are upside down? You didn't reef in time. Laptop or Tablet (with GPS): When I equipped Reboot six years ago the choice of a laptop vs a multifunction display was pretty easy. The multifunction displays were quite bulletproof. The laptops were not. It is my belief that the state of the art has reached the point where laptops are a viable alternative. Free navigation software like OpenCPN and free charts for the US ((Free ENC chart downloads) make up to date US navigation inexpensive to free (you already own a laptop or tablet, right?) You may need to purchase a GPS puck - about $35 for the USB version, closer to $100 for a Bluetooth version) if your laptop does not have a built in GPS that works off the satellite system, not the local cell towers. DeLorme inReach (about $300 plus service plan) or SPOT Satellite Messenger (about $150 plus service): Again a major change in technology has resulted in much lower capital costs. In the old days a marine and/or HAM MF/HF radio (known by cruisers as an SSB radio, $1,900), an SCS modem ($1,200), an antenna tuner ($500 - $1,200) and an insulated backstay (a few hundred bucks for parts and installation) were considered the only way to go. These options are substantially cheaper and my field tests have shown the inReach to be quite reliable at sea - my friends report the same for the SPOT. A nice feature of both is that they send "tracks" on a regular basis. This is great if you need to request the "vertical elevator" from the Coast Guard. It is an open question whether these are sufficient as an emergency signaling device. You will have to decide on your own. 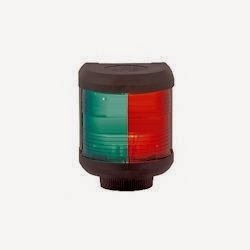 EPIRB and/or PLB: Emergency Position Indicating Radio Beacon ($450); Personal Locator Beacon ($300.) Both of these devices have but one purpose: to tell SARSAT that you need the "vertical elevator." The advantage of both of these devices is that they tell the global search and rescue system (SAR) that you are in trouble and provide a GPS position and homing beacon to assist in your rescue. The inReach and SPOT require the service provider to interface with the SAR control centers for your rescue. Since the SAR system uses AMVER (automated mutual vessel rescue system) to dispatch assets to your location the coordination between the inReach or SPOT provider and the SAR assistance vessels has an additional level of complexity. I would choose a PLB attached to my life jacket for a solo sailor, an EPRIB for multiple people on the boat. Remember, they are going to find the device, not you. You better be firmly attached to the device. Solar Panels or Wind Generator (or both): All this cool stuff takes power - a lot of it continuously. The price of solar panels has dropped (about $250 per 135 Watt panel) to the point where they are very affordable. Charge controllers range from about $40 to a couple of hundred, in most cases the cheap ones are fine. And there will be some additional cost for mounting the panels. There are days, particularly in the winter, when the solar panels just don't put out much charge. Unfortunately wind generators are still in the $1,200 price range plus the cost of mounting. But I would still put one high on my list. Life Raft or Immersion Suits: Another technology decision with significant cost differences. An offshore life raft is going to cost between $1,600 and $4,000. Every five years the cost to inspect and refresh the raft will be about $2,000. An alternative is an immersion suit for each person on board (about $300.) You have seen them on The Deadliest Catch. One can save a lot of money if one is willing to bob around in the ocean (one assumes in very bad weather, that is how you got into trouble in the first place) with no protection from the seas nor food and water. My personal preference is that a life raft is a must. Wind Vane Autopilot: Nothing is more tiring than hand steering in the open ocean for hours at a time. You need something to take the load. Examples include Monitor and Hydrovane. These are anything but cheap - figure at least $3,000. They have two advantages: they use no electricity and they follow the wind (that means you will not wake up in the middle of the night with a crash gybe taking down your mast because of a wind shift.) Many electronic autopilots can follow the wind but most require you to constantly approve of the course changes. This is not terribly useful. Electric autopilots become less efficient with more wind, wind vanes become more efficient. Plus the more the wind and waves the more the electric autopilot will consume your batteries. Yes, I have both on Reboot. The electric autopilot was factory installed. I love it for light winds conditions and traveling in channels (like the ICW.) Figure $2,000 to $2,500. Roller Furling: Jib furling systems have been around for years. They are easy to justify. The cost of the furling system vs the cost of multiple head sails for various conditions gives the jib furler the edge. Prices range from $300 for very small boats to $1,500 for a typical cruising boat. Mainsail furling systems have been around for a while but are finally becoming mainstream. Figure $1,500 to $2,500 independent of what you may need to pay a sail maker to adapt your mainsail to the furler. Ask anyone who has ever had to reef the main on a pitching deck at night in high wind about the experience and you will know why (it has been reported) that 90% of new boats are now being delivered with mainsail roller furling. Dinghy and outboard: When I first started sailing Reboot (the first one, a Catalina 30) with my family I thought a dinghy and outboard were important. Because at that time my lifestyle was family cruising we spent just about every night in a marina so I dragged the dinghy around for a couple of years and finally left it at the marina where I kept my boat. Since I now anchor out most of the time these have become "must haves." After fighting with my soft bottom inflatable and 9.9 HP engine in choppy anchorages I upgraded to a RIB (about $1,0000 and a 15 HP outboard ($2,500.) With multiple passengers or a heavy load the difference is like night and day. Radar: I equipped Reboot with radar before AIS became ubiquitous. It has proved itself handy under two conditions: sensing the course and speed of an oncoming storm (the radar reflects of the rain) and in heavy fog such as I encountered frequently in the Canadian Maritimes. Watermaker: An expensive device ($3,800) of limited utility in North America, Central America, the Caribbean and Europe. In these locations bottled tap water has become ubiquitous and cheap. These devices require a lot of care, can not be used in most anchorages due to pollution, and make an annoying noise when in use. They may be valuable in the Pacific and Asia, I don't have any experience in those areas. XM (or Sirus) Marine Weather: I love this. I wish the coverage was more than just the United States. Getting semi-real time Nexrad radar, buoy day, wind and wave data, forecasts, etc. takes the load off all the other communications gear and displays it all in once convenient place. Yesterday Maury and Ginger (Gypsysails) headed down from New Bern for a great reunion. Maury was the first ocean cruiser I met after embarking on my live aboard life. The three of us buddy boated on and off for a couple of years. Then Maury and Ginger took a needed break from cruising. This weekend is the Oriental Boat Show so we spent several hours just mucking around the show. Maury and I also talked about upgrading my refrigerator. The current unit has a mean time to failure of one nanosecond so this might be the "big upgrade" for this yard period. We had a great time catching up and will most likely do some more stuff together before I head North to the Chesapeake for the summer. Quiet day. Scrubbed the hull to remove the ICW smile and prepare it for touch up bottom paint. With thunderstorms forecast for tomorrow it looks like a postponement. I have been filling and purging one fresh water tank. It apparently got some salt water in it during the last trip. And I went through all the paperwork that has been piling up. So, a good day, not a great day. In heavy seas things tend to pop open if not secured. Such was the case with the toilet paper dispenser door. When I went to close it the piano hinge had sprung. So my small project for today was to remove the door, fill the screw holes with toothpicks soaked in wood glue, let the entire thing dry and then reassemble it. Which I did. I realized that the next time I went out in the ocean this would likely happen again. So once the repair was complete I added an external latch to prevent it from popping open again. Hopefully this will do the trick. On Reboot one stops the engine by pulling on the handle (see picture left.) It is a very simple mechanical device. There are two drawbacks: the handle is exposed to the elements. This requires a large quantity of lithium grease to keep the salt water from making the pull wire stick; and the original handle was plastic. After a few good pulls the plastic threads stripped. I had to resort to using a pair of pliers when I wanted to stop the engine. It would seem a simple thing to purchase a replacement "T" handle. Not so. After spending upwards of $50 to "special order" a replacement handle that did not fit I resigned myself to just using the pliers. One of the employees of Sailcraft Service here in Oriental is Dan (see picture left.) I know from experience that Dan can fabricate just about anything. So while we were sharing a cup of coffee I ask him if he could make a simple "T" handle threaded for the existing cable. Of course he said yes. About a hour later I stopped by his shop and was presented with this beautiful little stainless "T" handle. Sometimes is is just knowing the right guy! You may remember that I replaced the bow light on Reboot at Masonboro Yacht Club. It didn't work, but subsequently I got it working. Of course it stopped working again. After a bit of playing with it I discovered that the tabs that are intended to make the electrical connection to the light bulb were not touching the light bulb. Since the socket and the light bulb came as a single purchase I was quite annoyed. I did manage to bend the tabs a little bit to get some tension on the light. Its working - for now. Great quality control AquaSignal - NOT! One of the annoying things on Reboot is that the liner tends to come out of the rub rail in heavy seas. I feel like I have snapped it back into the holder at least 10 times. For some reason it always seems to be the port rub rail although there is no sign of damage or deformation to the track. One of today's project was snapping all 42' of rub rail liner back into the track. I have learned two tricks: to always push the re-bedded rub rail sideways - this avoids a big lump at the end of the snapping back in; and to use a pair of pliers to squeeze the rub rail back into the track. Even so I am now sporting a big blister on my palm. The Silos Restaurant in Oriental, NC has added an outdoor stage and seating area behind the restaurant. Tonight was opening night marred a bit by cold weather. The set up is a modest stage and nice outdoor seating area that sells beer and wine. It turns out the the back of the restaurant sits on a county line so the stage is actually in the next county. Thus the need for a different liquor license. Best wishes to Chris on his new venture. OpenCPN - will proprietary chart plotters become extinct? I started in the computer business in college at Stevens Institute of Technology. At the time there was no disciple called computer science. Rather, the electrical engineering department was the repository of computer knowledge. Stevens was an early adopter - it had relationships with both Unisys and IBM. In the first semester of my freshman year I was required to take a course in Fortran programming. I loved it so much that I spent the next 3 1/2 years working in the college data center. I learned on an IBM 1620 and a Univac 1105 programming in machine code, SPS (symbolic programming system) and later in COBOL. Stevens was one of the very first places to get an IBM System/360. For the super techies among you - we started with "Primary Control Program," a single thread single execution model, went to TOS (tape operating system), DOS (Disk Operating System) and finally OS/360 MFT (Multitasking with a fixed number of tasks.) I graduated prior to the introduction of OS/360 MVT. It was only natural that I would become a computer programmer. Even after I was promoted into information technology management I continued to code for fun, and in fact write computer programs to this day. What does any of this have to do with OpenCPN? With the introduction of chart plotters (and now multi-function displays) I think many of us with programming skills thought it would be a cool idea to write a chart plotting program. We soon learned that this was a non-trivial project. A group of people did get together and create OpenCPN. They were committed to produce an open source (hence the "Open" in OpenCPN) Chart Plotting and Navigation software package that would be available for free on multiple platforms (Windows, Mac, Android, etc.) They have succeeded brilliantly. Since its first release in 2007 it has been through several upgrades, the current version is 4.0 OpenCPN will read several different chart formats breaking the "if you buy my chart plotter you have to buy my charts" monopoly of the commercial chart plotter manufacturers. In fact, if you only sail in the United States and its possessions you can download every chart published by the US Government updated once a week with the latest corrections for free! How is that for a deal! In addition it will control your autopilot and display your AIS targets. Go here: http://www.nauticalcharts.noaa.gov/mcd/enc/download_agreement.htm to download the free charts. The result is that OpenCPN has, for free, in my humble opinion, more functionality than any commercial chart plotter available today. So spend some time looking at OpenCPN and enjoy! When traveling by boat (or for that matter any mode of transportation) a constant question is: "What is at my potential destination?" For years the source of this information was "cruising guides", books with information about marinas, dining, fuel availability, etc. With the advent of the ubiquitous Internet that information is now available on "crowd sourced" web sites. Essentially cruisers volunteer to provide information on a web site that is shared by other cruisers. Active Captain has a very large database of information on the East Coast of the United States, its world coverage is a bit less. It is a good service and I have used it a lot. 1. Since it is linked to OpenCPN I expect more users to start to participate. 2. It permits one to "check in and out" of various locations. These "check in's and out's" are then reflected in the data base. One can "friend" other boats. As a consequence their current location will show up on your OpenCPN chart. One's boat does not need to check in, the last location transmitted will be updated in the data base. Updates can be sent from a maximum of every ten minutes to a minimum of once a day. Of course sending logs requires an Internet connection. However the system will log one's track and send the entire track when a connection is available. Kind of neat. A final entry is Good Anchorage: http://www.goodanchorage.com/ Although I have an account I have not used this web site to any great extent. The Plan: Jacksonville, FL to Port Morant, Jamaica, to and through the Panama Canal. Maximum seas 15 - 18 feet. Destination reached - Oriental, North Carolina, USA.